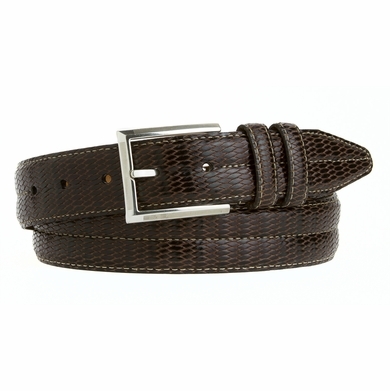 1-1/4" = 32mm Wide genuine italian calfskin leather brown belt. Snake pattern in the front of the belt with a soft feeling in the inside. Dress belt for a proper fit and to style your clothing and shoes. This color can be matched with white, khaki, gray, blue, red, and yellow. 5 Holes for easy fit adjustment and a silver plated buckle with small stripe design in it. Matching keepers. Stylish center and edge contrast stitching for extra support.